UIView animation is available when the selected layer is of UIView type. For UIView animation, you can only change its animation settings in group timeline. In keypath timeline, you can only change its keyframe settings. These are two methods used to generate UIView animation code which are UIView:animateWithDuration:delay:options:completion: and UIView:animateKeyframesWithDuration:delay:options:animations:completion. QuartzCode automatically select feasible method based on the layer timelines settings. Duration of all timelines are equal. Start time of all timelines are equal. All timelines must be of basic animation type. 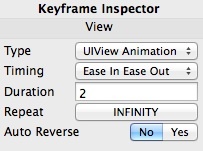 When the condition of UIView:animateWithDuration:delay:options:completion not met.